I do this for another blog I run, so I thought it might be a fun idea to do it here, for country music too. 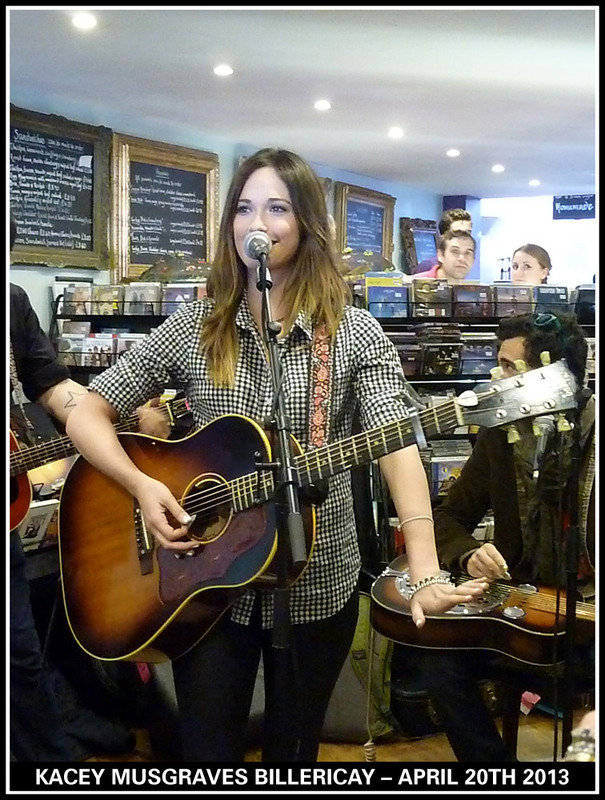 What better way to start off than with a photo of the incredibly talented Kacey Musgraves, which I took when I saw her at Slipped Discs’ in Billericay on April 20th 2013. 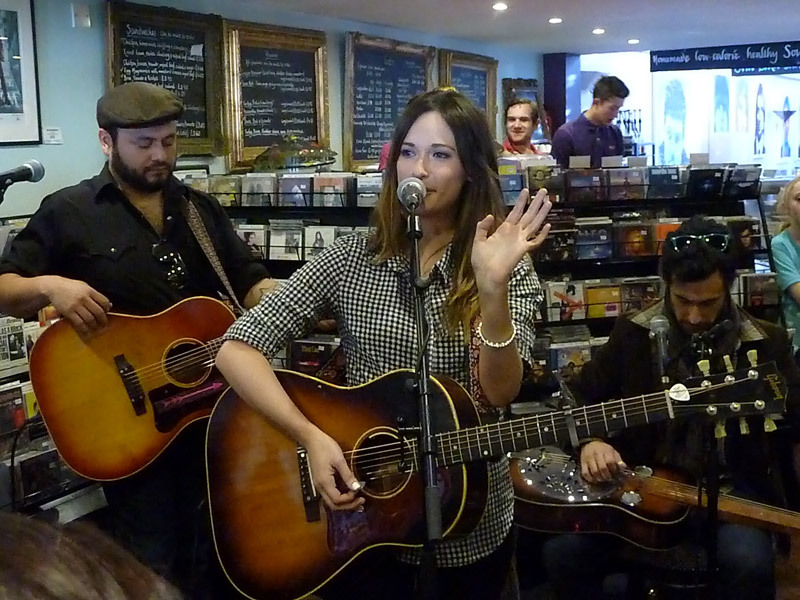 This was the first time I saw Kacey in 2013, the second time was at a secret gig in London on August 13th 2013. 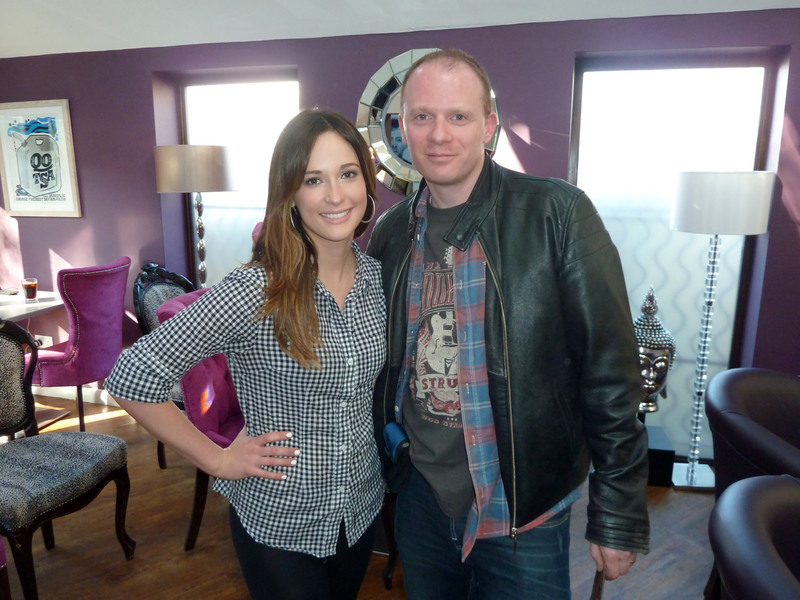 Now, less than a year on from the first gig, and Kacey Musgraves is a very deserving double Grammy award winner. So why top 9 and not top 10? Well, still being relatively new to the country music scene I spent a lot of 2013 listening to albums that didn’t actually come out last year. So as much as I might have played Eric Church and Brantley Gilbert a lot, neither of their albums came out last year and are thus not valid. But Eric did have an album out last year I hear you cry! Yes, but I don’t have Caught In The Act, yet (that may change by the end of this article), it was Chief I was referring to. There were then albums such as Annie Up by The Pistol Annies which I just didn’t find worthy a place in a top list. It was okay, but not a patch on their Hell On Heels album, and nowhere near the quality of the albums I have placed. So, now we have that sorted, let the countdown commence! The first time I heard the second album from this Perry family trio I wasn’t impressed, and that disappointed me. I loved their debut album and Better Dig Two was one of my absolute favourite songs of the year. I was all ready to throw my toys out of the pram, and CD out the window, when I had a change of heart and decided to give it another chance. Do you know what? It grew on me. Better Dig Two is by far the stand out track, but the title track Pioneer is a cracking song, with Don’t Let Me Be Lonely not far behind. Mother Like Mine still irritates me, in that Kimberley isn’t the only one in the band whose Mother that is. A great pop country album with tons of cross over appeal. I love live music albums, and after seeing Gretchen Peters live in June, getting her live CD/DVD combination was a given. Woman On The Wheel contains live versions of the songs on her latest album Hello Cruel World, with 3 bonus tracks. One of those extra tracks is Wild Horses, which was originally by The Rolling Stones, and not The Sundays as Buffy the Vampire Slayer fans might think! If you’ve never heard Gretchen before then please check her out as there are few people in music that put as much passion into their music as she does. The album comes presented in a hardback book format with a stack of photos, and a DVD with it. For shame I’ve not yet watched the DVD, but as well as an hour long look back at the tour, it also includes music videos for several of the songs. If Vickye from For The Country Record needs a partner in her crusade against Bro-Country then she need look no further than the son of country legend Waylon Jennings, Shooter Jennings. There are a few tracks on this album that are used as a vehicle for Shooter to vent his frustrations, but none more obviously than Outlaw You, which declares “Hey pretty boy in the baseball hat, You couldn’t hit country with a baseball bat, Country ain’t just about where you’re at, It’s about bein’ true to what’s inside”. Now I’m not against Bro-Country, and that’s something I’ll discuss at a later date, but Outlaw You is easily one of the best country songs of 2013. The album is a showcase for what a fantastic song writer and musician Shooter Jennings is, and proves that not every male country singer of a certain age is shying away from the more traditional roots and only thinking about beer and trucks…not that there is anything wrong with that, not in my eyes (and ears) anyway. If it wasn’t for Twitter I wouldn’t have even known that a) Ashley Monroe was a member of The Pistol Annies, and b) she had a solo career and an album out last year. Along with a certain Kacey Musgraves, I heard a lot of buzz about her album and so decided to check it out, and thank goodness I did. Here was a young lady who knew what kind of record she wanted to make and didn’t feel the need to compromise in any way. A traditional country album in essence, but with modern influences and a good dose of beguiling attitude. In fact, I would have liked to have seen more of the sassy attitude shown by Ashley on her album, on Annie Up, where I was expecting it. Weed Instead of Roses was one of the songs of 2013, without a doubt. We just need her to tour in the UK, please. I feel like this should be higher, and if this was based on live performances she most certainly would be, but for now a top 5 spot is pretty damn good. In 2013 I went from not knowing much about LeAnn to seeing her live at Country 2 Country, getting this album, and then seeing her live again in October. It was her performances of songs from her new album at C2C, especially Borrowed, that made me a fan, and I was particularly delighted when I won tickets in a ukCOUNTRYmusic.NET competition to see her for a second time. Spitfire is an eclectic mix of songs showing all sides of LeAnn’s personality, from the aforementioned tear inducing Borrowed to the foot tapping Gasoline And Matches. That last song featured none other Ron Thomas and Jeff Beck – how about that for a superstar lineup! Spitfire is one of those albums that I always chastise myself for not listening to again sooner whenever I do play it. You can’t have compilation albums in this list! Says who? This is my list, on my website – I say what goes, and these get included, together as one entry no less! As a show Nashville is fun, but a little too soap opera for my liking, but the music is tremendous. Like many I became a huge fan of Scarlett played by Clare Bowen, and her duet with Sam Palladio’s Gunnar of If I Didn’t Know Better was the highlight of the album. We also got the absolutely enchanting Telescope from sisters Lennon Stella and Maisy Stella, which was also done by Hayden Panettiere. It was Volume 2 that I actually preferred, and a lot of that was to do with Panettiere and especially her rendition of Nothing in This World Will Ever Break My Heart Again, which at one time I couldn’t stop playing. We don’t have a start date for season 2 yet here in the UK, but I for one can’t wait for some more CDs of great songs from an interesting mix of actor come singers. Mr Paisley was one of my discoveries of 2013, and I actually became a fan of his before Wheelhouse came out. That meant I could actually look forward to the new album and even had it pre-ordered. You can read my full review of it here , but like the two albums that make up the number 1 and 2 spots, this is one that I listened to repeatedly and still listen to regularly now. Brad is the act at the upcoming Country 2 Country that I am most looking forward to seeing play live. Aside from Accidental Racist with LL Cool J, it’s an almost flawless album which combines humour, with a good does of emotion, memories, and the all important guitars. When I started writing this article last weekend I didn’t even own a Tim McGraw album and couldn’t have named you one his songs if my life depended on it – thankfully it didn’t! Then I played Two Lanes of Freedom, again and again, to the point where I must have listened to it more than 10 times in the last 7 days. Every time I listen I get something new out of it and gain a new appreciation for the songs included in this masterpiece of an album. It really does have everything, and I’m still not sure whether I prefer the very touching and beautiful Annie I Owe You A Dance and Friend of a Friend, or the pulsating Truck Yeah, or maybe even the star studded Highway Don’t Care. You can read the full review I wrote of Two Lanes of Freedeom here, and just know that this album from Tim McGraw came within a whisker of getting the top spot in this countdown. The first time I listened to Kaceys Musgraves’ debut album I was blown away. Such an incredible mix of great song writing, beautiful vocals and all bundled up with that charming attitude that only she can pull off. There’s a dose of traditional, a handful of modern, but quintessentially, it’s Kacey Musgraves, a name and voice you will hear for many years to come. Filler is something quite alien to this album, as every song is pure gold, and Follow Your Arrow was my song of 2013, and like the album, is in my top ten of all time. The fact that in the same year I discovered her, I saw Kacey Musgraves play live twice (April and August), is just the icing on a very special cake. For a debut album it’s a very bold one, as she doesn’t shy away from singing about exactly what she wants, no matter how controversial that may seem. However, she’s been received as well as by the critics as by us fans, and is undoubtedly the breakout star of 2013. There’s only one thing that can come to close to Same Trailer Different Park, and that’s the prospect of a second album. So there we have it, my top 9 country music albums of 2013, and having just received Drinks After Work by Toby Keith and Caught In the Act by Eric Church, I could well be adding a 10th album to this list very soon. I have only listened to the Brandy Clark and Holly Williams albums once, and have releases from Lindy Ortega, Darius Rucker and Keith Urban still to get, to name but a few. 2013 for me was a year in which I discovered more great music, new and old, than any other in over a decade, and 2014 promises to be every bit as good, and maybe even better. 12 months ago I said Getting into country is like opening the wardrobe to Narnia – an amazing world of music and people that I never knew existed, and wow, is that ever an under-statement. I love how varied the genre of country music is and how it includes so many great artists and styles. There really is something for everyone, and I’m trying to consume as much as I can – it’s a buffet of excellent music I can’t and don’t want to stop going back for more. Who knows what happened 12 months ago – I had a great response form the few weeks of blogging I did on 4000 Miles to Nashville, and then decided to start writing country music articles elsewhere on my personal blog – crazy! Well 2014 is a new year, and part of that new year is a renewed dedication to blogging about what has fast become my favourite genre of music. When I last updated this blog I hadn’t even seen any country music live, but since then I’ve had the great pleasure to see Gretchen Peters, LeAnn Rimes, Logan Mize, Ben Glover and of course LeAnn Rimes again at Country 2 Country, along with Carrie Underwood, Brantley Gilbert and Darius Rucker. 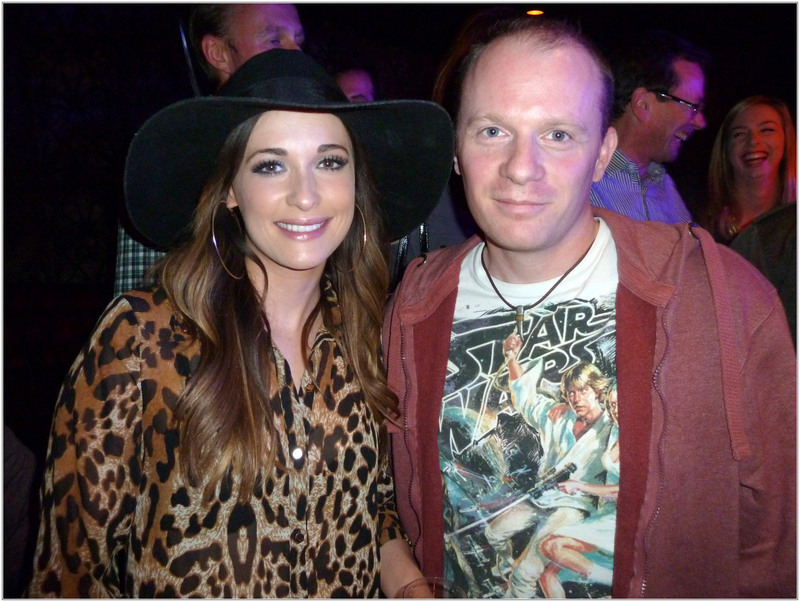 I also saw a young lady called Kacey Musgraves, twice, the second time being when I was invited to a special secret gig of hers in London. I’m still not sure how that happened – maybe down to the review I did of her first gig in April 2013? Who knows! Speaking of Kacey Musgraves, she was my biggest music love of 2013, and her album Same Trailer, Different Park was by far the most played CD I bought last year. In fact I liked it so much I even bought it on vinyl too – yes, I still buy and play records! Seeing her live and meeting her twice were definitely among the highlights of the previous 12 months, though LeAnn Rimes may have something to say about that. It was quite surreal seeing someone who I previously knew from little more than the Coyote Ugly soundtrack, belting her heart out in such a personal and passionate way in London, twice. So, I’m back, to stay this time, and as always if you have any recommendations then please send them my way. Last week I got a friend request on Facebook from someone in Nashville who I didn’t recognise, and as I’m fussy about who I accept as a friend on Facebook I didn’t accept straight away. I did the natural next thing, and Googled this person, only to find they work for a music management company who represent, among others, Kacey Musgraves. My immediate thought was that they must have read my review of her record store gig in April and maybe I will be involved in something for her upcoming tour in October? Might sound crazy but I was contacted by Lady Antebellum’s PR company to review their latest album after I reviewed their Own The Night World Tour Blu-ray. With this in mind I accepted the request and within minutes had a message to say that as a fan of Kacey’s they had some news for me, and could I email them. At this stage in the proceedings I was on my laptop and saw there was an earlier message from said individual, but when you are not friends the private messages get logged in other, which the app version of Facebook doesn’t show you. Thank goodness I accepted that friend request, as it turned out the news was me, and a couple of friends, being invited to a secret gig in London taking place yesterday, August 13th. The secrecy was emphasised and we were not to talk about it or mention it on social media until after the gig. I of course adhered to that – why would I jeopardise the opportunity to see one of my favourite singers live, and in such an exclusive setting. It wasn’t until 3.30pm on the day that I got an email telling me the venue, which turned out to be The Arts Club on Dover Street, spitting distance from The Ritz. Don’t worry, I’m theorising, I didn’t put it to the test. It was a press event put on by Decca Records to introduce Kacey to the music press here in the UK, and she wanted some of her fans present as well. Once inside, what was one of the more upmarket venues I’ve had the pleasure of watching a performer, I made a beeline for the table at the very front. It was actually the only table in front of the stage, but my reasons for choosing that were twofold: Selfsihly I wanted to be as close as possible, who wouldn’t? But performing in front of a room made largely of the press, I thought it would be nice for Kacey to see some fans, who knew her and her music. Okay, so it was mostly for the selfish reasons, but there was a dose of altruism too. 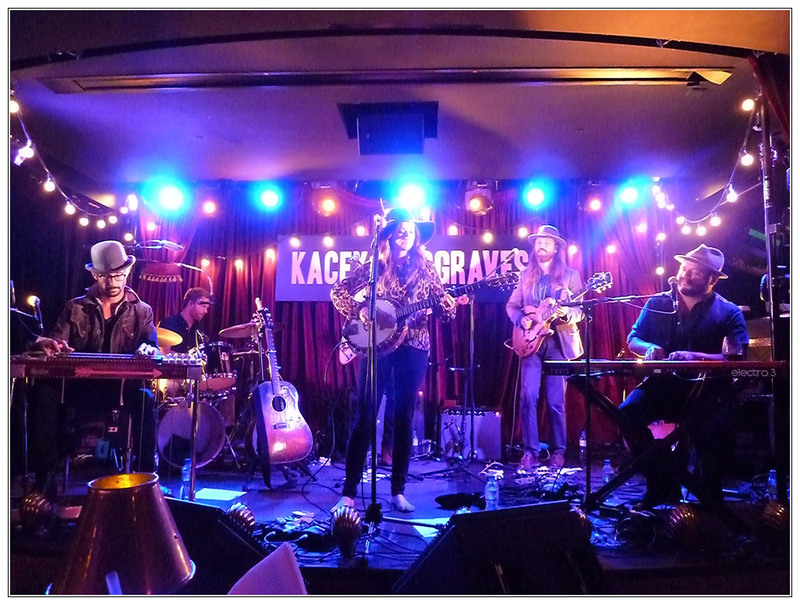 Unlike the aforementioned record store gig, Kacey had her full band with her, which consisted of a drummer, 3 guitarists and a lap steel guitarist. We were welcome by the guy from Decca Records, who introduced Kacey Musgraves, who the New York Times earlier in the year called The Next Big Thing From Nashville. She looked slightly nervous, but you wouldn’t know that from her voice and guitar playing, which as always were audio perfection. It took less than one song for Kacey to kick off her high heels and carry on barefoot, and looked much more comfortable for it. 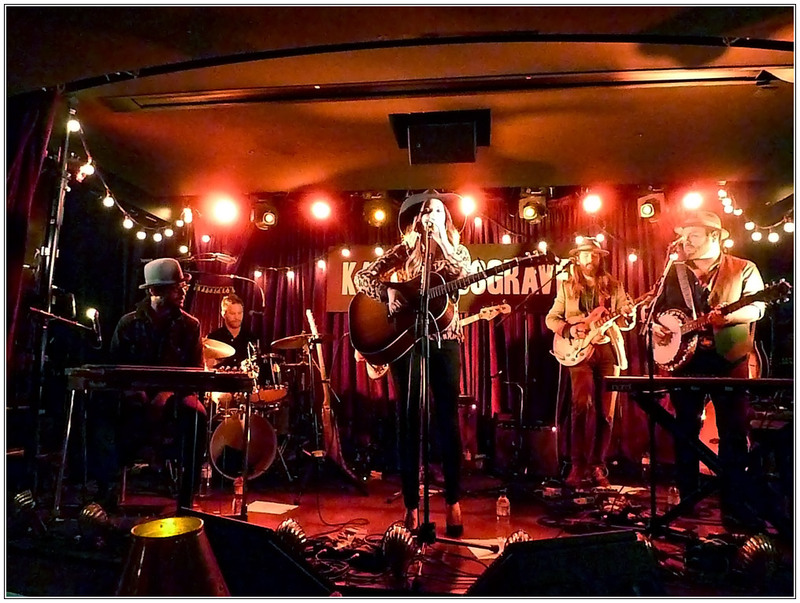 The nerves soon disappeared, and who can blame for having them in the first place – she was playing to a room of UK journalists, and this particular area of London couldn’t be more different to Nashville. I declined the chance to take a photo of the set list which was taped to the floor before the gig started, and as I try to recall what she played I’m thinking that may have been wise. The highlight for me was Follow Your Arrow, which is not only my favourite song on her album Same Trailer Different Park , but has also become one of my favourite songs full stop, much like her whole album. Kacey smiled when we sung the parts that the crowd generally do during that song, and when I say we I mean my little group as well as other fans in attendance. Kacey gave the story behind each song, with honest and often humble delivery. Us fans lapped up her set, and the applause from the press certainly sounded more than just polite, and at times I had to remind myself that this wasn’t just a normal gig with everyone there as followers of her music. After songs like Silver Lining, Merry Go Round, Same Trailer Different Park and Step Off, the set was rounded off with a very energetic version of My House which saw the whole band having fun on the stage which was only just big enough to contain them all. Looks like I didn’t need that set list after all, though I may have missed one and in what order they were sung I can’t be sure. I’d be very surprised if the invited journalists weren’t as enchanted by Kacey as I have been since I first heard her album at the beginning of the year. She combines a beautiful voice with songs about real life, that you don’t have to be from Nashville to relate to. I got to chat to Kacey after the gig, and she was as charming as always, especially when I gave her the picture my 5 year old son had drawn for her. He’d wanted to come to the gig after seeing her back in April, but being 13 years below the age limit a picture would have to do. It was fantastic to see Kacey and her band perform live, and I’m grateful to both Katie for inviting me, and Kacey for coming over and playing in the middle of her US tour. I feel slightly guilty in that I’ve seen Kacey play live twice now, and both times I’ve not had to pay. I have bought tickets to her October UK tour and will be seeing her at the O2 Shepherds Bush Empire. I also bought her album on both CD and Vinyl, and being vocal about her talent to people I meet, I think I’m on the positive side of the balance sheet. On her album she’s great and live she’s great, if you hadn’t figured it out already I’m urging you to check out Kacey Musgraves. If you know her already then you’ll be nodding in agreement. I do agree with the New York Times, though we can leave out the Nashville part, she’s simply the next big thing. 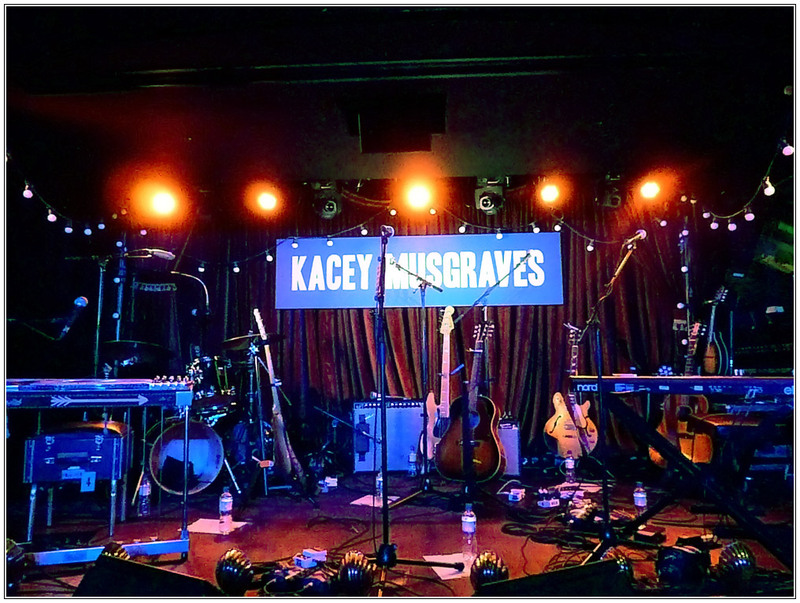 A month or so ago the name Kacey Musgraves started to pop up, a lot, on Twitter amongst the country music community. So much in fact that after reading this great review of her album Same Trailer Different Park there was only thing left for me to do – jump aboard the bandwagon and order the album myself, which I did. On the very first listen I knew I’d come across something pretty special, and as Same Trailer Different Park ran on almost constant loop for the next week, it became clear that Kacey Musgraves was someone I was going to hear a lot about in the coming years. Kacey combines her deliciously smooth vocals with some great storytelling, bringing both sentiment and a great outlook on life. It’s one of those albums that if someone had asked me at any time in the last 4 weeks what 10 albums I’d take with me onto a desert island, Same Trailer Different Park would have been one them. That’s high praise indeed for a singer has only been on my radar for a month. 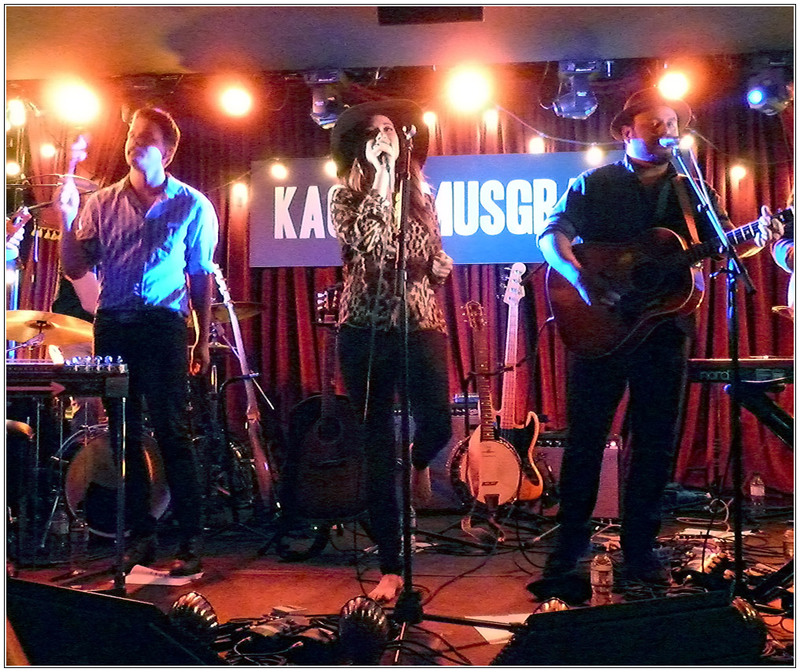 Just last Monday Kacey did her first UK headline gig in London but I was unable to attend, much to my disappointment. 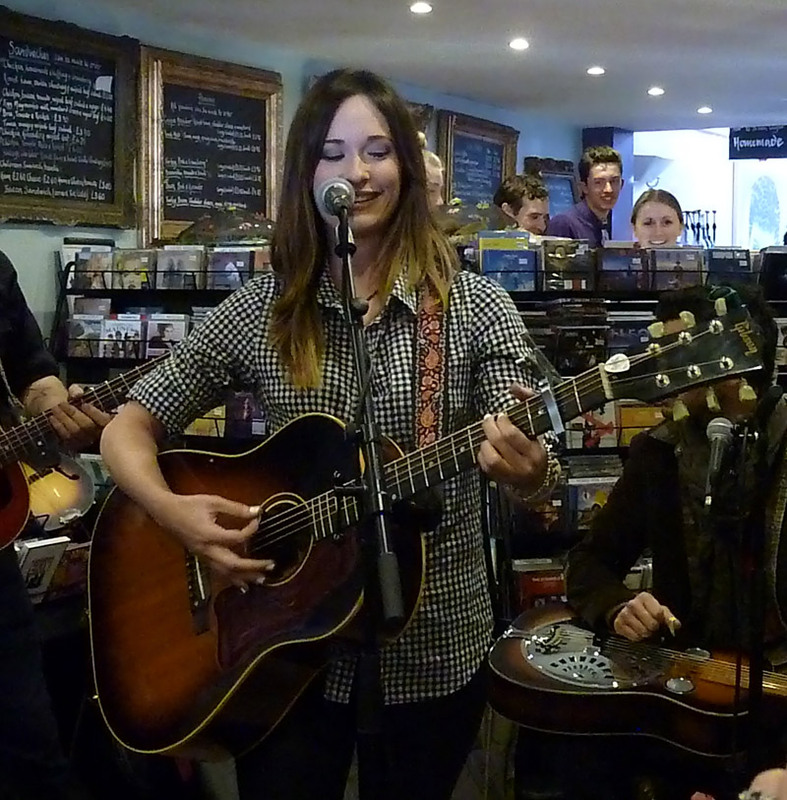 However, anguish very quickly turned to delight as it was announced she would perform a 30 minute acoustic set at Slipped Discs’ Brown Sugar – a record store in Billericay, Essex. Whilst not being familiar to most, Billericay is actually where I lived for the first 9 months of my life, but have not been back to for 38 years. Well that was about to change, as I made plans with my wife and son to drive down to my birth town and see this amazing new singer who I’d been listening to almost constantly for the past few weeks. At 4 years old this was to be my son Lucas’ first ever gig, and he even went as far as drawing a picture to give to Kacey, should he get the chance. A fair crowd had gathered by the time Kacey walked through us and onto the stage, her band along with her. I was fortunate enough to be second row as people craned to watch from the front of the shop all the way to the back and into the coffee shop area. The first taste we got of Kacey’s musicianship was during the sound check, for which she apologised for the time it was taking. I actually found the whole process very interesting and when it’s the actual singer and her band performing the sound check rather than just some technicians, well it’s like a mini practice gig in itself. Sound check done we actually had a warm up act come on first, a young lady called Georgia who got told whilst on stage she’s be singing 2 songs and not 1 as was previously planned. To her credit she took it all in her stride as she sung a cover of Gnarls Barkley’s Crazy followed by her own song Blue, which she will be releasing interdependently. She did very well and has a lovely voice, and probably wasn’t expecting to play in front of so many people! The time was 4.20pm, the date was 4/20 (for Kacey it was being that she’s American) and she was playing in a store on High Street. This is how Kacey opened her gig, much to the amusement of those of us who got what she was saying anyway. What then followed was not the half hour that had been promised but way past that and approaching an hour of sublime acoustic music. You often hear people say that a singer sings effortlessly, probably to the point of overuse, but that is something you can genuinely say about Kacey. On stage she looks like there is nowhere else she would rather be and to be singing and playing for us is a gift that she cherishes and takes full advantage of. She started off with Blowin’ Smoke, which couldn’t have been more perfect given her 4:20 references from just a few minutes earlier, and followed this up with tracks from her album, a great song about trailer parks and the hit song she wrote for Miranda Lambert; Mama’s Broken Heart. The only time she didn’t look utterly at ease is when she got a request for On The Map from the crowd. This wasn’t a planned part of her set and she wrestled with whether or not she should do it, because she hadn’t played it for some time and her band hadn’t played it at all. Being the free spirit that she is she thought to hell with it and gave it a go, and though a few of the lyrics did go awry, it’s so nice to see someone being totally them self on stage and mot being thrown off kilter by an unplanned addition to her set. The highlight for me came towards the end when Kacey sung Follow Your Arrow, a song I’d requested she sing over Twitter for the 2 days leading up to this gig. Do I credit myself for this being included? Yes, but given that it’s one of her most popular songs I think that credit would be well and truly unwarranted. She actually revealed Follow Your Arrow was a late addition to the album, but she loved it so much she had to include it, and thank those heavenly stars she did. The gig ended with her first recent single Merry Go ‘Round, which saw practically everyone in attendance singing along. What a brilliant way to bring to an end a stellar performance from of one Nashville’s rising stars. Her band deserve credit too, and they were Misa Arriaga and Adam Ollendorff, who along with Kacey herself gave us some wonderful stringed music to go along with those great vocals. 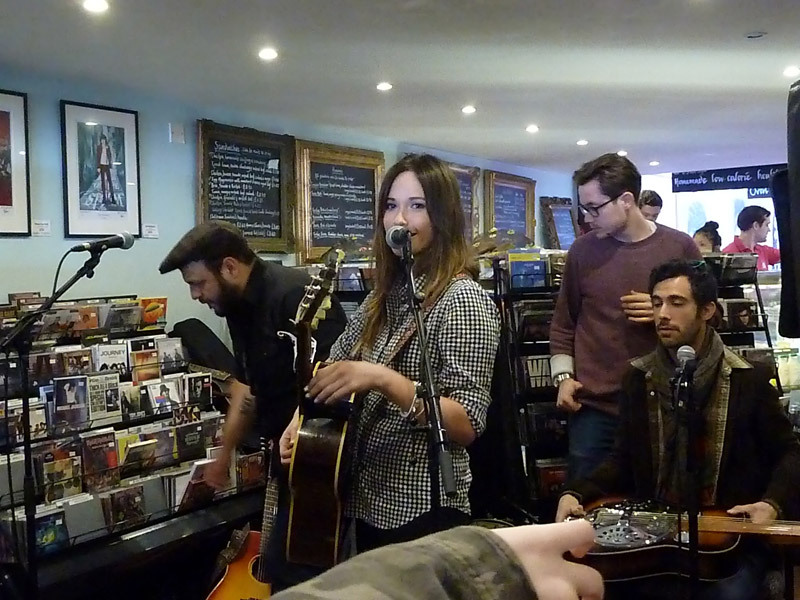 Kacey seemed genuinely delighted to see so many people come out to this record shop in a small town in Essex, but the pleasure was all ours. After the gig she stayed to sign CDs and pose for photos. When it was our turn Lucas gave her the picture he’d drawn, explaining it was of his house and a select few Star Wars characters. She signed his poster “Happy 1st Concert” and then posed for a photo with him, also taking a photo with her own phone too. Could Lucas be her youngest fan? After having a photo taken myself I bought her album, again, on vinyl, as it had been made available especially for record store day. A great gig which came with another piece of good news at the end – she’s coming back to tour in the UK in October. I’m certain that almost everyone who saw her play on Saturday will be buying tickets to those shows, as I saw fans of all ages buying CDs and queuing up to get them signed. I feel privileged to have seen her both perform and to meet her – it surly won’t be long until she’s packing out arenas all over the world, the success coming her way is utterly deserved.